This event is open to Cultural Coalition Partners and those who are not-yet-Partners. For planning purposes, please RSVP HERE for this FREE WORKSHOP. They will provide an update on the 2019 Legislative Session, including the status of arts, culture and tourism policy recommendations and priorities. This event is part of the Southeastern CT Cultural Coalition’s C.R.E.A.T.E. for nonprofits program. Bodenwein Public Benevolent Foundation Bank of America, NA Trustee, Frank Loomis Palmer Fund, Bank of America, N.A. Trustee, Dominion Foundation, Chelsea Groton Bank, Robert G. Youngs Family Foundation, Inc., and our Supporting Cast Members, Donors and Partners. MASS MoCA's Assets for Artists FREE workshops Return to CT! No Replies to ""It's Not Too Late to Advocate!" 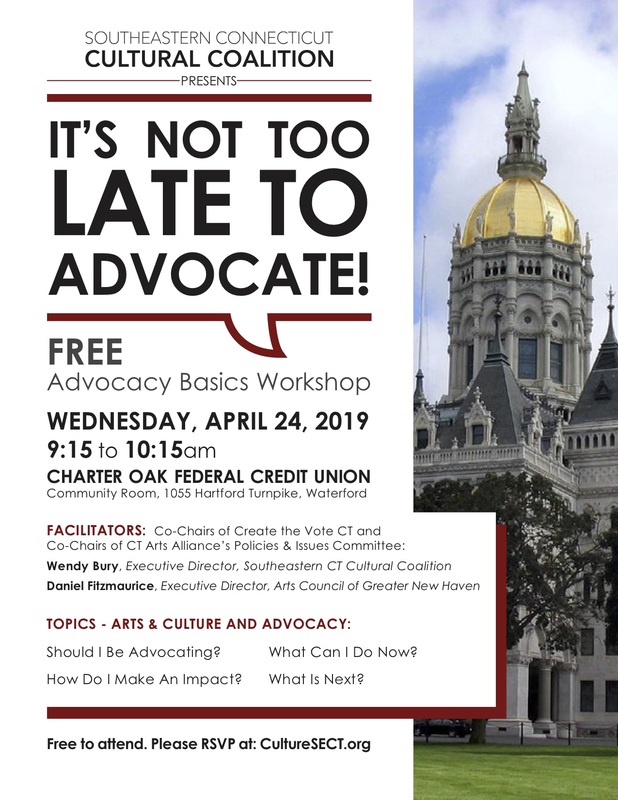 Advocacy Basics Workshop"
MASS MoCA’s Assets for Artists FREE workshops Return to CT!